OP3241. 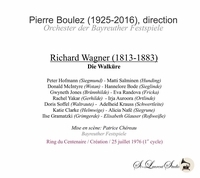 DIE WALKURE, Live Performance, 25 July, 1976, w.Boulez Cond. Bayreuth Festival Ensemble; Donald McIntyre, Peter Hofmann, Gwyneth Jones, Hannelore Bode, Matti Salminen, Eva Randova, etc. [The second day of the First Cycle - a far superior version than the later performance already available on Video, these CDs [not DVDs] are in breathtakingly brilliant stereo sound!] [Regarding this performance, note the fascinating BOULEZ IN BAYREUTH book, B0058] (Canada) 3-St Laurent Studio YSL T-645. Transfers by Yves St Laurent. "As a member of the audience at the first performance of the Boulez RING in 1976, I can attest that this performance is clearly superior to the DVD version from three years later. Both Jones and McIntyre are in finer voice, and the freshness of the performance and Boulez's conducting remain an unexpected marvel.. What a 'find'." 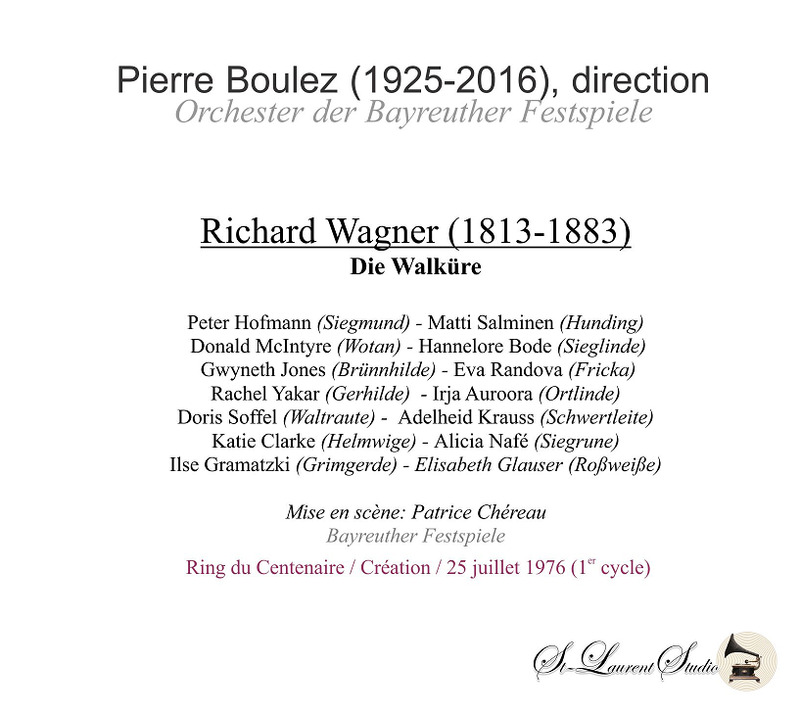 "Boulez's ultimate achievement as a recording artist is the video of the RING, filmed in Bayreuth, in which his lithe conducting provides the perfect counterweight to ChÃ©reau's convulsive directorial vision to become available on home video on VHS tape and on LaserDisc, as well as being released on Philips LPs and compact discs. [The now-offered performance is a CD presentation of the earlier performance.]" "Donald McIntyre was one of the noted bass-baritones of the second half of the twentieth century. He was a fine actor with a compelling stage presence and a full, rich voice that made him ideal for heroic baritone parts and one of the favorite Wagner singers of his time. His Covent Garden debut was in 1967 as Pizarro in Beethoven's FIDELIO, but he made his strongest early impression at Covent Garden that same year as Barak in DIE FRAU OHNE SCHATTEN. By then he had gained a considerable reputation as a beginning Wagnerian singer, and was asked to debut at Bayreuth in 1967 as the Telramund in LOHENGRIN. 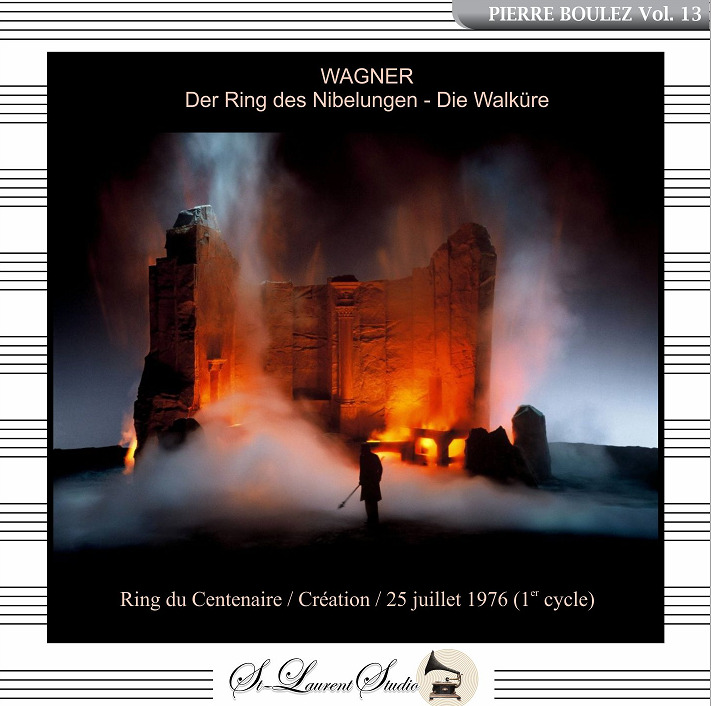 In 1973 he became the first British singer to sing the role of Wotan in a complete cycle of the Wagner RING DES NIBELUNG at the Bayreuth Festival. He repeated the feat at Covent Garden beginning in 1974 with a Covent Garden Cycle that began that year with Colin Davis conducting, and debuted at the Metropolitan Opera in 1975, again as Wotan. In 1976, he starred in the Centennial production of the RING at Bayreuth in the controversial production conducted by Pierre Boulez." "Towering in physical stature, Finnish bass Matti Salminen offers a voice to match. From the beginning of a career that has made him one of the leading singers of Wagner's bass roles, there was no question about his voice placement. It was no bass baritone, but a true bass, huge, dark, focused, and possessed of a reassuring steadiness. By the time he had reached his mid-thirties, he had both mastered the tradition of great Wagner singing and discovered the means to pace himself in that most arduous of all repertoires. By the start of the 1990s, he had become the pre-eminent Hagen of his time, sardonic in mien and powerfully incisive of voice. He had distinguished himself in Mozart, as well, having no rival but Kurt Moll in the role of Osmin. He began a lengthy association with Bayreuth in 1976, making his first appearance there as Hunding in the first year of Patrice ChÃ©reau's controversial RING. Salminen's Metropolitan Opera debut took place on January 9, 1981, when he sang King Marke. Subsequent roles there have included Osmin, Sarastro, Rocco, and his defining Hagen. As he entered his fifties, Salminen's voice became somewhat less steady than in his younger years, but it remained an imposing, untiring instrument. At Chicago in the late winter of 2002, he undertook an exhausting schedule, alternating Gurnemanz with Sarastro on an almost nightly basis. To both roles, he brought great dignity and an even firmer adherence to legato singing than before. Well-documented on both audio and video recording, Salminen's signature roles offer a model to other aspiring basses. His Hagen ripened into a terrifying study of malignancy under James Levine in the Metropolitan Opera RING. His intense Osmin under Harnoncourt's leadership remains a superlative study, bracingly sung. His Landgraf, Daland, and Hunding likewise reside near the very apex of great vocal interpretation."